Jambo! is the friendly greeting Swahili traders offered their customers in Central Africa before colonization. The players are traders in this day, competing to be the first to earn 60 gold by selling tea, hide, fruits, salt, silk, and trinkets. The game is played with cards which represent goods, people (which can help you or hinder your opponent), and animals (which add a bit of spice to the game). Players take turns with up to 5 actions per turn until one player reaches the goal and wins the game. 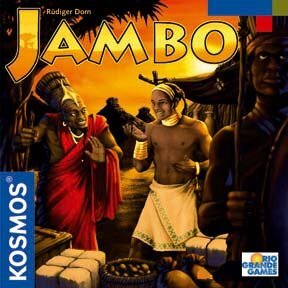 Other products in the "Jambo" series. Jambo is one of the best two player games I've played in quite a while. Light strategy mixed with card actions and a bit of luck. Sometimes you only need 3 actions. Other times 6. But with only 5 actions allowed per turn you have to plan ahead which cards to play. I love it. A great two player card based game. The theme is fun, and the cards are engaging. The short time play means that you will end up playing the game multiple times in a row. As you become more familiar with the cards the game shines. This game has the card interactions of a collectable card game without the hassle of buying lots of cards and creating your own decks. Jambo! feels like so much more than just a 2 player card game. The many combinations that can be made with the action cards give a feeling of freedom and exploration in the game. My wife and I's favorite 2 player game....lots of great fun trying to edge out your opponent acquiring the right goods and getting to 60 first. Highly recommend.